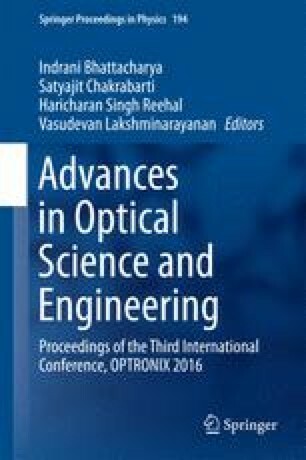 In this paper design of all optical logical AND gate is proposed based on 2-D photonic crystal. The structure proposed consists of Si rods placed in air background with T-junction using line defect and point defect in the photonic crystal. Finite difference time domain (FDTD) and plane-wave expansion (PWE) methods are used for the simulation and analysis of the performance of the proposed gate. The size of the logic gate is only about 16 μm × 16 μm and it works in the 1550 nm wavelength. The contrast ratio obtained for this structure is 11 dB. A good forbidden band gap in the normalized frequency range of 0.277883 ≤ (1/λ) ≤ 0.417455 for Transverse Electric (TE) mode is obtained for this structure. Therefore, band gap width is 0.139572. The simplicity and the small sized T-shaped structure along with high contrast ratio make this device suitable candidate for integration in optical communication.